Whenever I make the statement “every patient has a brain,” I hear the same joke: you haven’t met my patient. Of course, they’re kidding, but there’s a dangerous assumption in their joke. What’s more concerning is that many clinicians have seemingly forgotten that every patient has a brain. There are three major issues that warrant discussion. First, let’s discuss the assumption that pain comes from tissues. The Cartesian model that correlates tissue issues (nociception) to pain is over 350 years old, and it’s still doctrine in medicine and various therapies. The model is false. You can have tissue injury and no pain. You can have pain and no tissue injury. For too long, practitioners and patients have sought answers to their pain by exploring the various tissues, including joints, muscles, ligaments and more. 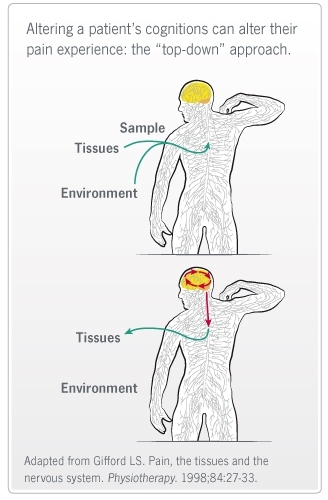 Pain is leading reason that people seek care, and when they do seek help for pain, they are presented a tissue-based model to explain their pain. Think about it: A patient comes to you seeking help for pain, and you teach the patient anatomy! No wonder pain rates in the US have doubled in the last 15 years alone. Never before have we performed as much surgery or prescribed as much medicine for pain in the history of mankind, and pain rates are ever increasing. A large portion of the blame should be leveled at these outdated models. It’s time practitioners wake up and realize people in pain are interested in…pain! This leads us directly to the second issue. There is also an assumption that patients are not smart enough to learn the latest neuroscience of pain. Shame on us for thinking that. Research has shown patients are in fact able to understand the biological processes of pain. Therapeutic neuroscience education (TNE) takes complex neurobiological and neurophysiological processes and explains pain to patients via metaphors, examples and pictures. We have been teaching people about pain for years, in various countries, to different age groups, in different languages, to various ethnicities, etc. The end result? They all get it. The best part is they experience less pain and disability; move and function better despite no hands-on interventions; catastrophize less; are less afraid and are able and willing to move further into pain during exercise and functional tasks. Healthcare education has simply become a display of knowledge. “Let me tell you how much I know about….” The language we use is completely foreign to patients. Even more worrisome, the current medical vocabulary contains various terms and languages that actually increase fear and anxiety. Ever been guilty of using terms like torn, ripped, instability, bleeding, rupture and so forth? The third issue needs special attention. Manual therapy, electrical modalities, exercises and so forth have been around for decades and form the mainstay of many therapies. These approaches are still based on the Cartesian model: intervene on tissue level and pain will get better. How is that working out for us? One in four Americans has persistent pain. The key issue is right in front of you, every day. It’s attached to your patient. Every patient has a brain! Current therapies focus so heavily on a bottom-up approach they forget this simple fact. The sad reality is that the cognitive approaches, such as therapeutic neuroscience education and altering a patient’s beliefs, may be far superior in their outcomes compared to traditional bottom-up treatment models. Pain is 100% produced by the brain based on the perception of threat. What a patient thinks and believes contributes to their pain experience considerably. Altering what a patient thinks or believes can alter the patient’s pain experience, hence the “top-down” approach. It is suggested this approach could be far superior to the typical bottom-up approach. For example, patients who receive sham surgery for compression fractures, but believe the tissue issues are fixed during the surgery, perform just as well as patients who actually have the compression fracture surgically corrected. Chronic pain patients’ functional MRI scans show reduction of brain activity after neuroscience education, results that are far superior to any narcotics currently used on the market. Forward flexion and straight leg raise improves significantly in chronic pain patients after receiving TNE and no hands-on therapy. To date, a dozen high-quality randomized controlled trials and two systematic reviews have shown that when people in pain are taught more about their pain, their pain decreases, function improves, catastrophization reduces and they’re more interested in movement and exercise. Now, imagine you do both: a bottom-up and top-down approach. All clinicians talk to their patients. Sure, you could chat about last night’s game or the local weather report, but why not use any/all clinical time to teach patients about pain? You could teach them while doing the movement-based approaches of manual therapy, exercise and more. Time is running out. With healthcare reform and new reimbursement models being introduced, the stakes have never been higher to learn how to treat chronic pain patients. New reimbursement models propose a fixed fee per diagnosis and disability, and how a clinic or system treats the patient is up to them. The only caveat? There is no more money. Chronic pain patients will cause a significant clinical threat to practitioners who cannot effectively treat chronic pain. TNE provides clinicians with step-by-step, validated, evidence-based approaches to treat chronic pain patients. We have the research data to prove we don’t just merely “manage” these patients’ pain, but can actually help them recover and experience less pain and disability. The best part is that our current research (various papers accepted for publication or under review) has shown that TNE is helpful for acute and sub-acute patients as well. In these scenarios, patients not only experience less pain and disability, but TNE may in fact preempt the development of chronic pain. Chronic or acute, we know where all pain is produced. It’s time we start treating the brain, as well as the body.